From time to time, I feel the urge to write long, rambling posts about my eating habits and exercise habits, chronicling my attempts to stay fit and get fitter on this journey called life. It isn't always easy to write about these rather personal issues but it clarifies my thinking on the matter and also seems to resonate with many readers, so here we go. When I say "journey", it really is one, with many twists and turns as life circumstances seem to change on a regular basis. 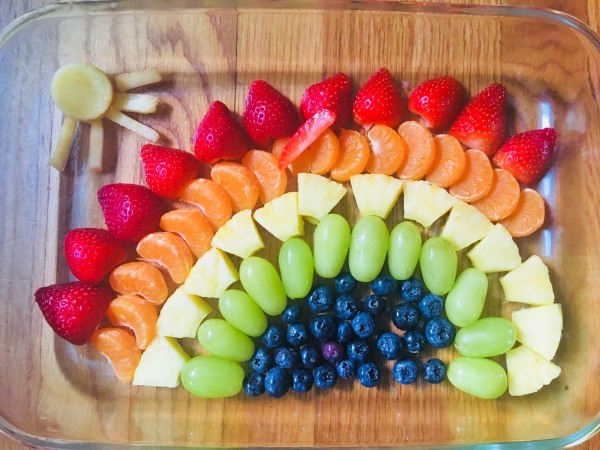 Almost four years ago, at the tail end of 2014, I wrote an honest and heartfelt post about my experience with gestational diabetes and how it spurred me to make some changes in the way I eat. It was a lighting bolt sort of experience and my biggest takeaway (apart from a bouncing baby girl) was an increased awareness of my personal risk and a determination to be proactive and prevent the old diabeetus to the extent possible. Sometime after that I was stumbling into an exercise habit after literally a lifetime of inertia. 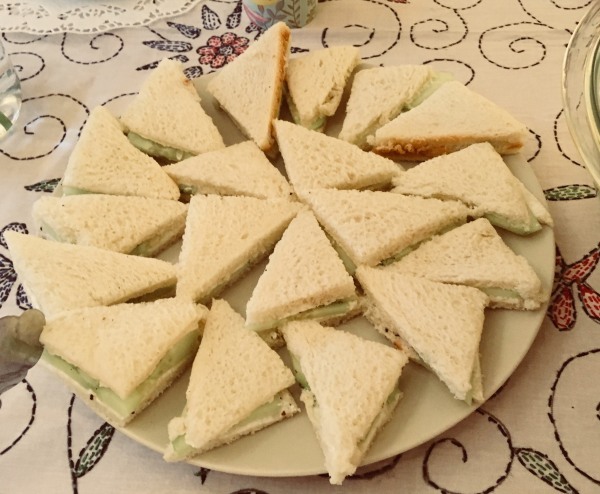 Then I had my second baby and most established habits of the years before were thrown to the wind for a good year or two; I felt like I was back at square one. Earlier this year, I wrote again about my struggles to put a regular exercise habit in place. The story since February: Over Spring, I participated in a nutrition research study. The incentive for participants was that we got 3 DEXA scans done over the course of several months. DEXA scans are non-invasive scans that are the gold standard for determining a person's body composition in terms of muscle, bone and fat. When I got my scan results back, I was pretty stunned. It showed that I was at a normal BMI (albeit at the high end of normal) but with a level of body fat that is high enough to be categorized as "risky". A "skinny fat" sort of situation which has the makings of metabolic syndrome and many chronic diseases including diabetes. This was another wake-up call right there and it called for some lifestyle changes. Exercise is for fitness, eating habits are for weight control. "Eat less, move more" is a slightly misleading mantra. Diet and exercise don't have equal influences on a person's weight. Exercise accounts for only a small fraction of our daily energy expenditure and increasing exercise alone is unlikely to result in weight loss. Over Spring of this year, I was exercising regularly and quite intensely but was startled to see my weight creep up by a few pounds during that time. The reason was pretty simple- I was simply eating more than I needed to, and it wasn't being offset by the exercise. If a person is looking to lose fat (weight) and can change only one thing about their life, then diet would be overwhelmingly the right choice. You cannot out-exercise a poor diet. Keep exercising anyway. Regular exercise has incredible benefits and is one of the best things you can do for your quality of life. It may not have proven results for weight loss but it helps in countless other ways, like building muscle, and improving sleep and mental health. My current schedule: This August when the school routine started again, I pulled up our family's calendar and penciled in my exercise schedule. In my experience it is the only way to "make time" for something, otherwise it remains wishful thinking. In Spring, I took a strength training class called BodyPump and although the high-repetition nature of that class was not right for me, it turned me on to the idea of continuing strength training in a different format. Now I'm doing a small group women's weightlifting class twice a week and absolutely loving it. It is a serious, challenging workout but there is lots of support and camaraderie to go around. This class is my best shot at building some much-needed muscle. Other than that, I swim twice a week and do a short run on the weekend. If you include my beloved weekly ballet class, I'm exercising 6 days a week most weeks. To my amazement, I enjoy and look forward to all of these workout sessions, even though I lack stamina and all forms of exercise are very hard for me. Small humans don't need a lot of food. I barely scrape 5 feet in height, with a small frame. When they say that "the average person needs 2000 kilo-calories a day", well, I'm way smaller than the average person. It is easy to forget this fact. The small person problem is that you don't have to binge on whole pizzas and pints of ice cream to gain excess weight. A few unneeded second helpings and some extra snacks here and there are all that are needed to make the pounds creep on. The extra pounds have absolutely nowhere to go when you are petite. For the first time in my life, I experienced joint pain and a couple of episodes of lower back pain. That itself was enough to convince me that I need to (a) lose fat and gain muscle and (b) stay at a healthy weight. Don'd do anything to lose weight that you wouldn't be happy to do for the rest of your life. 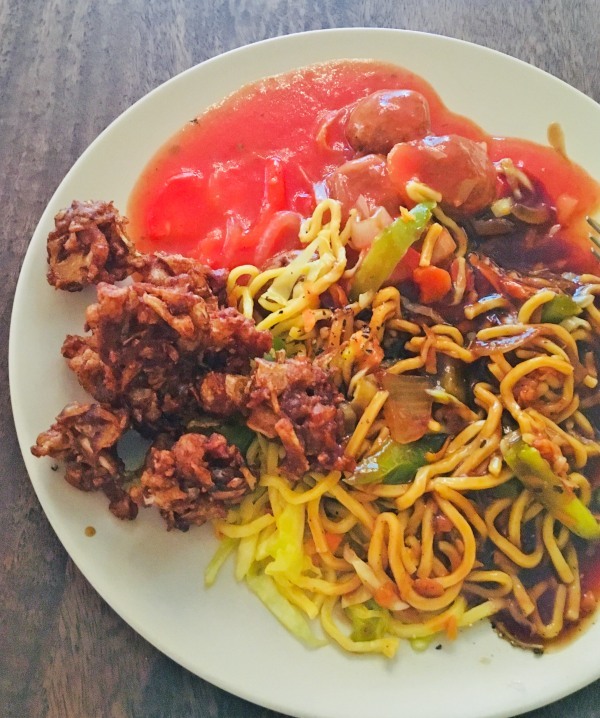 "Eat everything in moderation" is a terrific concept but when you find yourself gaining unwanted pounds, that is a clear sign that the moderation ain't as moderate as it needs to be. But I stay far away from temporary fixes and special diets, because I'm only going to gain the weight back once I go back to "normal". I am only interested in building some good habits and letting go of some others that aren't serving me. Eating habits are a mental thing. For people who are well-fed and carrying around copious amounts of stored fat, we have never known true hunger. We are surrounded by tempting food in all directions and it is easy to get used to feeling full, and use food as a self-soothing tactic when we're stressed or bored. I'm trying to catch myself when I do that. I did a sugar free month nearly a year and a half ago and it has had lasting effects in weaning me from automatically reaching for sweets whenever I see them in front of me. Use your foodie tendencies for a good cause. You can use your foodie tendencies to your advantage, making foods that are very satisfying and tasty but also wholesome and satiating. Overeating is a form of food waste, and if there is anything I abhor, it is food waste. Even as I enjoy cooking and eating, I am trying to remind myself that food is fuel and primarily for nourishment. Tastes change. This is something I have learned in the last few years. Salads were never my first choice for something I'd want to eat. Now I make hearty salads in a dozen different ways and thrive on them. Tastes can change and change is good. Learn from others. This summer, our family went on vacation to the Georgia golden isles with my BFF from St. Louis days, Neighbor Girl. She is, and always has been, a fitness enthusiast. 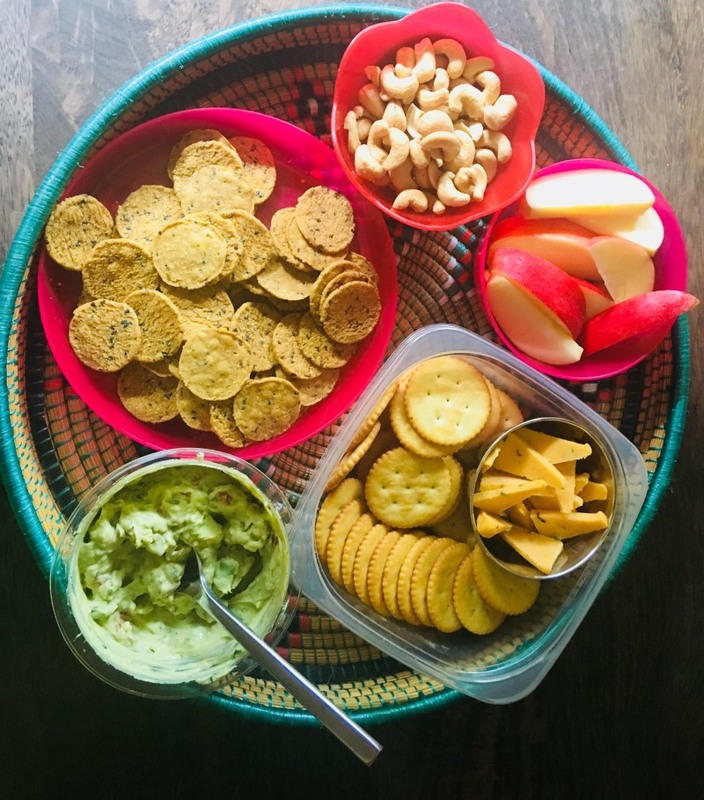 I learned so much from watching her eat all week- the snacks she chooses, the quantities and types of foods she eats. Incidentally, I am a $$ saver by nature and she is a spender who struggles to keep a healthy bank account balance. So I have a little something to teach her too. We pick up tips just by being around each other. There are plenty of resources out there. You need to be discerning and pick and choose what advice to take, but there is a lot of inspiration out there. Other than books, recently I have been lurking on some Reddit forums like LoseIt and xxfitness. As an example, here is a weight loss compendium from Reddit. All the resources provide fodder for experimenting on myself and trying to find my own way. My personal habits have ripple effects. I'm the primary grocery shopper and cook for my little family. I also regularly make meals for friends and visiting family, and bring dishes to potlucks and such on a weekly basis. Whatever positive changes I make in my eating habits also benefit my family and that in itself is a huge source of motivation. I am only a few months away from a big milestone birthday- the big Four-Oh. I'm working on a fabulous birthday gift for myself- a chance to start this decade off in the best shape of my life, at a weight that is healthy for me and with an exercise habit firmly in place. Who knows what curve balls life will throw (as life does) but I want to be able to honestly say that I am grateful for my body and never take my good health for granted. Note that I am not a nutritionist (or physician/ fitness coach etc.) and nor do I play one on TV. This is an essay of my personal experience and not to be taken as personal advice to anyone. Tell me your thoughts- what works for you, what are you struggling with? Inspire me with your stories! I have a very quick post today, sharing a meal idea that we've eaten on repeat throughout the summer. This one uses a few staples from the fridge and freezer to put together a light and satisfying dish in a semi-homemade sort of way. 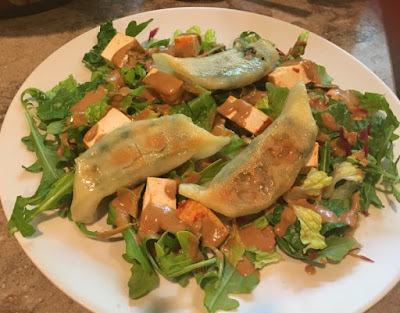 Also, I ardently love Chinese take-out and this salad topped with warm dumplings and a tasty peanut sauce easily satisfies that longing for take-out on a random weeknight. It does have a few components to it, but nothing that's labor or time intensive. Drain and blot away liquid from a block of extra firm tofu. Cut into bite size cubes. Heat a couple teaspoons of oil in a nonstick skillet. 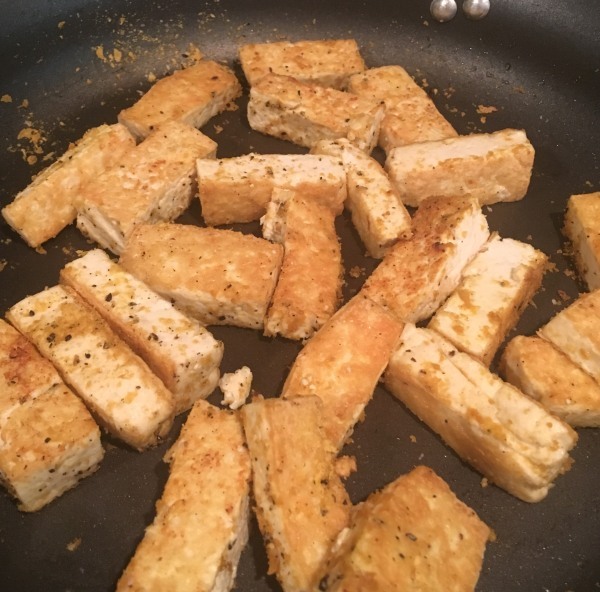 Place the cubed tofu in a single layer in the hot skillet. Let it cook patiently until golden. Resist the urge to keep stirring the tofu! Then, flip the tofu cubes and repeat. Once the tofu is fairly golden, add 2-3 tbsp. nutritional yeast and salt and freshly ground pepper to taste. 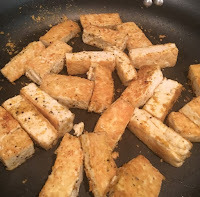 Keep turning the tofu cubes gently until they get a nice golden crust. The salt and pepper tofu is so tasty by itself and versatile- it can be added to many different dishes. Set it aside while you make the sauce. I always riff on this recipe and don't think I have made peanut sauce the same way twice. Here is my "choose your own adventure" formula for peanut sauce. Something for heat, like sriracha sauce or crushed red pepper or Thai curry paste. Place ingredients in a blender, blend until creamy, then taste and adjust the balance of flavors. Peanut sauce can be stored in the fridge for a few days and used in salads, noodle dishes and as a dipping sauce. Component 3: Dumplings. It is really fun to make these from scratch. More practical for a weekday, however, is to buy bags of dumplings and store them in the freezer. My favorite is Trader Joe's Thai vegetable gyoza. Cook as per package directions. Component 4: The salad base. This can be any mixture of greens and raw veggies. Our house standard is the 50-50 blend of lettuce and baby spinach that is commonly sold in supermarkets. Sometimes I'll add shredded carrots and sliced raw bell peppers to it. Assemble the dumpling salad with the salad base on a plate, topping with cubes of tofu and warm dumplings, and finally a generous drizzle of peanut sauce. What have you been cooking and eating on repeat lately? Happy October, friends! My summer blogging lull led to an unplanned blogging break for a couple of months. September kept our family life humming as my parents were visiting over the month. 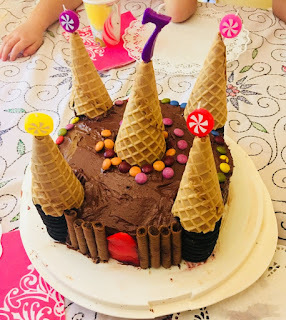 I left you with a post about birthday traditions and birthday cake and theme of cake (and summer heat, incidentally) continued in September as we celebrated more birthdays. 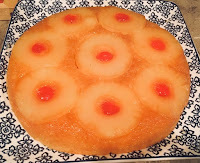 For my mother's birthday, I went with a Southern US favorite, pineapple upside down cake, using this recipe, because it says the "best" right there in the title and also, it is made from scratch and not from a mix. 1. Use a 10 inch cast iron pan instead of a baking tin. A cast iron pan is traditionally used for this cake and results in a beautiful bake. The other advantage of using a cast iron pan is that you don't need to melt the butter separately in a bowl. Just put it in the cast iron pan and pop the pan into the oven for a few minutes while the oven is preheating. 2. I used 1/4 cup butter (1/2 stick) and 1/3 cup brown sugar instead of the generous amounts specified in the recipe. This was more than enough to make a beautiful syrupy glaze. If you don't keep brown sugar in the pantry (I don't), it is very easy to make by adding some molasses to regular white sugar. I also reduced the sugar in the cake batter to 1/2 cup. The cake came together beautifully. I would highly recommend this recipe if you're looking for a small (8 servings or so) cake that tastes great, is not fussy to make and looks festive. We served the cake with some butter pecan ice cream on the side, because my mother loves ice cream. The birthday dinner also consisted of spinach lasagna (another of my mom's favorite meals) and garlic bread. Mid-September was a big day as our little girl turned 7 years old. It was a special one since her grandparents were here to celebrate with her. My parents always threw really fun parties for my sister and I, growing up, and they added some of their special magic into this party for sure. Lila wanted a tea party for a few friends with a castle cake. I searched online for something doable and cute, and the inspiration for this castle cake came from this blog, written in French but with lots of detailed pictures which make the process very easy to follow. I thought this castle was cleverly designed and beautifully finished. 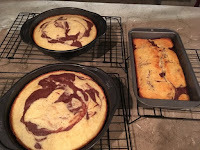 For the cake flavor, we went with a marbled cake for a nice mix of vanilla and chocolate flavors. If I had more time and energy I would have made a third pink color to marble into the cakes, just for princessy fun, but the basic two-color cakes worked fine. 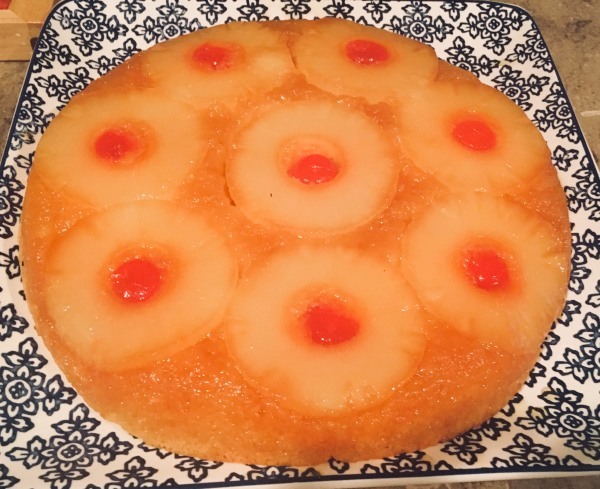 I used this recipe and made two round cakes. We weren't sure how many parents would stay for the party so to have enough servings, I baked an additional marbled loaf cake using this recipe. I always reduce the sugar in cake recipes and it seems to work just fine. The cakes were baked the evening before the party and stored covered at room temperature. The frosting was a whipped chocolate frosting- I used this recipe which makes a lovely frosting that is a delight to eat. It is a combination of butter, melted chocolate and a chocolate pudding all whipped up into a light and thick frosting. If you hate the greasy taste of conventional frosting then this is one to try. A couple of hours before the party, my dad (an adept cake decorator) and I put together the castle. The two round cakes were layered with a thin filling of raspberry jam and the cake was iced with a generous layer of the whipped chocolate frosting. Castle turrets: We made 4 small niches in the cake and stacked Oreo cookies to make the castle turrets. The roof of the turret is made of ice cream cones. We used some waffle cones but it wasn't exactly easy to trim and flatten their edges; I should have looked for flat bottomed sugar cones. The tops of the cones were lopped off just a little bit to allow candles to be stuck in. Lila wanted to play a part in the cake decoration so she made a castle door with a fruit strip, and the facade with some cocoa batons and put some candies on the top. All in all, we ended up with a very homely but sweet castle that looked like this! I didn't get a really good picture but you get the idea. Decades ago, for one of my childhood birthdays, my parents made paper butterflies and hid them in the yard for a scavenger hunt. We decided to do a reenactment. 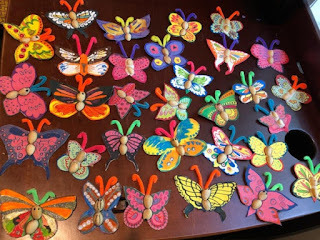 In the week before the birthday, my mom made a few dozen elaborate, hand-painted paper butterflies using paperboard from the recycling bin (cereal boxes and such). We hid them all over the yard and the party guests had a great time hunting for butterflies. For the tea party, we set the table with an embroidered tablecloth, some paper doilies and pretty china plates that I found in a yard sale. Along with the cake, we served pink lemonade, a rainbow fruit tray (painstakingly made by my mom) and crustless cucumber sandwiches. I promise we eat things other than cake around here! Indian Chinese as made by my mother! (d) Chips and dip- in this case sweet potato tortilla chips with guacamole. Task #19 of the Read Harder 2018 challenge was A book of genre fiction in translation. I realize I don't seek out any translated books so I went with the mystery genre (my go-to genre for casual reading) and read The Snack Thief (the third in the series of Commissario Montalbano mysteries) by Andrea Camilleri, translated by Stephen Sartarelli. This series is set in the fictional seaside town of Vigata in Sicily. Inspector Montalbano is a salty Sicilian, irascible by nature but with a good heart and keen perception. He is a food lover and what truly makes him emotional are beautiful meals, usually consisting of perfectly cooked pasta and seafood. In this book, Montalbano ties together three seemingly unrelated cases- the gunning of a fishing trawler's immigrant crewman in international waters, the stabbing of an elderly man in his apartment building's elevator and the case of a five year old boy who is stealing other kids' lunches. Sicily reminds me of Bombay in a way, with its quirky personalities and messy politics and corruption. For Task #12: A celebrity memoir, I picked up Neil Patrick Harris: Choose Your Own Autobiography. I've been a fan of Neil Patrick Harris right from his Doogie Howser, MD days to his role of Barney Stinson in How I Met Your Mother. This memoir was tremendously fun to read. It is written in a gimmicky "choose your own adventure" way, but what can I say? The gimmick works. It was fascinating to read about this phenomenally talented theater kid from a loving home who got a break working in TV at a young age, working on set in LA while still in high school in New Mexico. This is a charming and entertaining read, just as you would expect. Found in a library book sale! 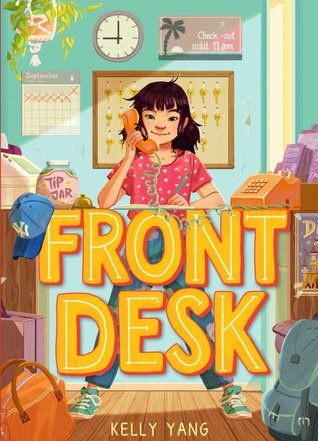 Front Desk by Kelly Yang is a newly published middle grade novel. 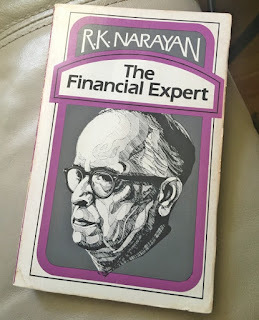 I came across a glowing and beautifully written book review for this book on Niranjana's blog and immediately went looking for a copy. Front Desk is a moving and heart-warming story (based on the author's own childhood) about a 10 year old girl, the daughter of recent Chinese immigrants, who runs the front desk of the motel that her parents are living in/ cleaning/ managing. My own kids are too young for this book but I know I will read it with them when they're older. If you are looking for a short and meaningful read, I highly recommend this book. And finally, just for the sake of nostalgia and in need of some comfort reading, I read The Code of the Woosters by P.G. Wodehouse. And it was as entertaining as ever. How was your summer? Catch me up on your life!